The Crusader's Relics are a set of Aedric artifacts, created by the Eight Divines and given to Pelinal Whitestrake, the Divine Crusader. The set includes a suit of armor, a shield, a mace and a longsword, which mold to the needs of the wielder and increase their proficiency in the School of Restoration. The artifacts were used by Whitestrake to banish Umaril the Unfeathered, an Ayleid Sorcerer King. In the battle, Umaril had dealt him a fatal blow, and with his death the relics were scattered and lost. In 3E 111, Sir Amiel Lannus founded the Knights of the Nine with the intent of recovering the lost relics. The order grew in fame, and recovered many of the holy relics, but after the War of the Red Diamond the knights slowly disbanded, losing all but one of the relics. In 3E 433, Umaril the Unfeathered returned to the mortal realm, having been reborn in the Fires of Creation due to his alliance with Meridia. The Fallen King led an attack on the Nine Divines by desecrating chapels with his army of Aurorans. Following the calling of a mysterious prophet, a pilgrim set out to retrieve the relics and reform the Knights of the Nine. The pilgrim succeeded, becoming the Divine Crusader reborn and destroying Umaril, body and soul. The relics are now held in the Priory of the Nine. The helm was created by Dibella, and gives the wearer a serene beauty. The followers of Pelinal built the Shrine of the Crusader in the halls of Vanua after his death, using the helm as an object of worship. The ruins of the structure were slowly engulfed by Lake Rumare. In 3E 153, Sir Amiel went on one final quest, hoping to restore the honor of his order - he ventured into the haunted ruins of Vanua, but died before he could reach the helm. When the pilgrim received a vision from Whitestrake, the Crusader pointed them towards the ruin. There, they found the bones of Sir Amiel, as well as the helm. The cuirass was created by either Mara or Akatosh. It offers magical protection to the wearer. This was the first relic recovered by the original Knights, who defeated the Wyrm of Elynglenn to claim it. The cuirass was the only relic remaining in the order's possession when it dissolved after the death of Sir Amiel. It was safeguarded in the priory's sealed undercroft, protected by the lingering spirits of the Knights. Many adventurers faced the ghosts of the Knights, but none were able to pass. The pilgrim entered the abandoned priory over three hundred years later, and proved themselves in single combat against the Knights; in return, they were allowed to claim the cuirass. 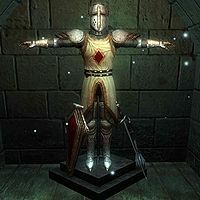 The Boots of the Crusader (also known as the Boots of Kynareth) were created by Kynareth. The wearer will not be attacked by creatures of the forest. Sir Juncan of the original Knights died while searching for the boots. The pilgrim visited the Shrine of Kynareth, and was told the location of the "Grove of Trials" by the high priestess (later to become Sir Avita Vesnia). Kynareth tested the pilgrim by sending the Forest Guardian, a giant bear, to attack them. When the pilgrim didn't fight back, having reverence for nature, Kynareth allowed them entrance to the grotto where the boots were hidden. The boots were needed to retrieve the Mace of the Crusader; with them, the wearer's faith is strengthened and they can cross the void of doubt. The Mace of the Crusader (also known as the Mace of Zenithar) was created by Zenithar. Those it strikes are burnt by holy flames, and it has the ability to turn the undead. According to legend, when Pelinal Whitestrake was slain, a messenger carried the mace to the settlement of Leyawiin. Centuries later, the master craftsman Saint Kaladas built the Great Chapel of Zenithar to honor the legend. When Kaladas died and was entombed in the Chapel, those who prayed to him began to receive visions of the mace. In the vision, the mace can be seen in the distance, separated by a void. The void symbolizes doubt, and an inscription on the tomb says to "walk in the faith". Sir Ralvas of the original Knights attempted hundreds of times to reach the mace, but failed each time. The pilgrim later discovered that the Boots of the Crusader are needed to cross the void; Zenithar has close ties to Kynareth, as craftsmen need to take resources from the natural world. With the boots, the path of faith was illuminated, and the pilgrim recovered the mace. The shield was created by Julianos. Shaped like the Chim-el Adabal, the symbol of the Imperial pantheon, the shield allows its wielder to reflect spells back at their casters. Sir Henrik of the original Knights retrieved the shield after he set out on his own. He and his friends hid the shield deep within Fort Bulwark, an abandoned Imperial fort; he died before he saw the protective measures finished. His ghost sent the pilgrim to the fort, which had been taken by a group of conjurers. The conjurers sought the shield, but had been unsuccessful in getting past the many traps and puzzles within the ruins. The pilgrim encountered another knight, Sir Thedret, imprisoned within the ruins. Once the pilgrim set him free, Sir Thedret passed on his limited knowledge of the puzzles, and later joined the reformed Knights of the Nine. After many challenges the pilgrim discovered the shield in the depths of the ruin. The gauntlets were created by Stendarr. The wearer is granted resistance to disease. Sir Casimir of the original Knights recovered the gauntlets, and brought them to the War of the Red Diamond. When he returned, he left the order, and went to the Great Chapel of Stendarr in Chorrol. Having been changed by the war, Sir Casimir grew impatient with a beggar one day and struck him down with the gauntlets. Stendarr, the God of Mercy, was appalled and cursed the gauntlets to fall to the floor, too heavy to move. Sir Casimir and his bloodline was cursed with immense fatigue. When the pilgrim came to the Chapel to recover the gauntlets, he met a descendant of Sir Casimir: Kellen. The pilgrim took the curse upon themselves, freeing Kellen of his woes and redeeming the gauntlets. The curse was later ended by the Blessing of Talos. The greaves were created by either Mara or Akatosh. They give the wearer increased skill in the School of Destruction, as well as allowing them to bless others with magical protection. Sir Berich Vlindrel of the original Knights discovered the greaves, and brought them to the War of the Red Diamond. They were buried with him in his family tomb in Underpall Cave. Sir Roderic of Wayrest and his squire Lathon, following the call of the prophet, recovered the greaves from the cave. Sir Roderic was then slain by the wraith of Lord Vlindrel, but Lathon escaped and brought the greaves to the Priory of the Nine. The pilgrim accepted them, and avenged Sir Roderic's death by freeing Lord Vlindrel of the evil which had ensnared his soul. The sword was created by Arkay. Those it strikes are burnt by holy flames, their magicka reserves depleted. It was discovered by Sir Berich Vlindrel of the original Knights, who brought it to the War of the Red Diamond. When he died, it was buried with him in his family tomb in Underpall Cave; in undeath, Lord Vlindrel dragged the sword down into evil, cursing it so that a righteous wielder would have stunted magicka. His wraith, infamous for haunting the Orange Road, wielded the weapon. It was recovered by the pilgrim who, after freeing Lord Vlindrel's soul, reconsecrated it on the altar in the Great Chapel of Arkay in Cheydinhal. Although not a part of the original set, or indeed a physical object, the Blessing of Talos was given to the pilgrim before they faced Umaril. It allowed them to follow Umaril's soul to the spirit plane, destroying him completely and finishing that which Pelinal Whitestrake could not. The blessing decreases nimbleness, but increases durability. This page was last modified on 28 September 2018, at 09:11.